“I am proud to support Barack Obama in his desire and mission to see America return to her greatness. I have carefully watched, like everyone else, the campaigns of both the democrats, as well as the republican candidate, and I could safely say that only one candidate is speaking to the beliefs I feel this country was founded on. It’s true, I wear my politics on my sleeve – I cannot help saying what I’m for and being clear about what I’m against. I’m not a political blogger, I don’t have the credentials or the interest to be a full-time political commentator, but today I’m relieved – Last night I saw Barack Obama win his second term as President. I was proud of my state, Iowa, for giving him 54% of the vote. The Republican’s view of women is reactionary. Why would women want to return to the days when men controlled our bodies? I don’t want the government in our bedrooms and in control of our bodies, and I certainly don’t want to see the reversal of Roe V. Wade. And, why should employers and insurance companies deny women coverage for contraceptives? It’s incomprehensible that we could return to the days of back alley abortions. I want women to be free to choose – to have access to legal and safe abortions and good family planning options. I’m a progressive, and like lots of progressives, would like to see a more progressive agenda put forward by the President. I don’t agree with his every move or decision, and have been bitterly disappointed by some of his choices. But, I think he is by far the best choice and the best shot we have. I see the alternative as going backwards, backwards in time, backwards in ideas, back to the days before laws were enacted to protect our civil rights. Iowa has a history with the President and the First Lady. When Obama visited Fairfield for the Iowa caucuses in 2008 – we helped him on his journey to become President. Before that, we’d heard his speech at the Democratic Convention when he was the Senator from Illinois – a rising star who brought crowds to their feet and touched our hearts with his vision for a better America. Obama has been able to touch a chord and connect with the problems and the dreams of everyday people, of Americans of all race and religion. Being Bi-racial gives him a unique perspective on race and an understanding of the commonalities that make us all part of the human family. He has a keen sense of fairness. We have a new majority of the voting population that consists of Women, Blacks, Hispanics, Asians, Indians, the Jewish Community, young adults, and college students (we came together for a second time to create a powerful united force to elect Obama). What we have in common united us to vote for Obama – we want a level playing field, fairness, economic opportunities, affordable healthcare, and of course, civil rights for all. The new majority recognizes a need in today’s America for our President to be “uniter not a divider,” a phrase ironically coined by George Bush who never delivered that promise. We need to respect and honor our human family worldwide. The rhetoric of Obama’s opposition divides us, polarizes us, and reinforces our fears that we are, in actuality, enemies. The opposition tells us we must belong to their religion or we have fallen from grace, that we must share their moral imperatives and world views or we are on the wrong side, that we must embrace their political ideologies or we are not real Americans. The Right Wing has created a mythology of what is means to be an American. This mythology supports a world view in which they occupy a moral high-ground and place of higher truth. This mythology consists of a narrow world view, and those who buy into it default to self-righteous indignation when their fundamentalist thinking and fallacious interpretations of democracy are challenged. When I first heard Obama speak, I felt he was speaking to a country’s better angels – angels of fairness, opportunities for all, compassion, respect, generosity and tolerance. 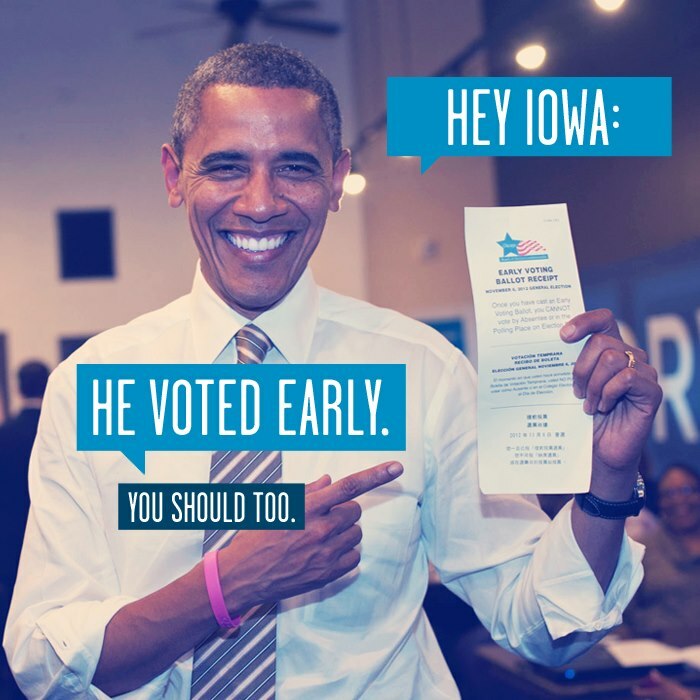 And this week, Obama came to Des Moines to enlist our support, and once again, Iowa delivered.